PRAYER PROMPT ••• Doors open and close; we use them to go in and go out. They are ordinary, yet deeply symbolic; they represent profound possibilities. The Apostle Paul wrote to the Colossians while in prison, “At the same time, pray also for us, that God may open to us a door for the word, to declare the mystery of Christ,” (Colossians 4:3a). A literal interpretation would be obviously: Paul wanted out of prison so he could get back to his job of spreading the Gospel. But if you’re familiar with Paul’s writings, you know he didn’t let a little matter like being imprisoned stop him from sharing God’s truths! Indeed, thanks to the closed doors of a prison cell, we have letters that are vibrant, full of Christian joy, and encouragement! Ephesians, Philippians, Colossians, and Philemon were all written by Paul during his time in a Roman prison! God used the time behind a closed prison door to open up the opportunity for Paul to write letters! Letters that may not have written otherwise – if Paul was free and too busy preaching! 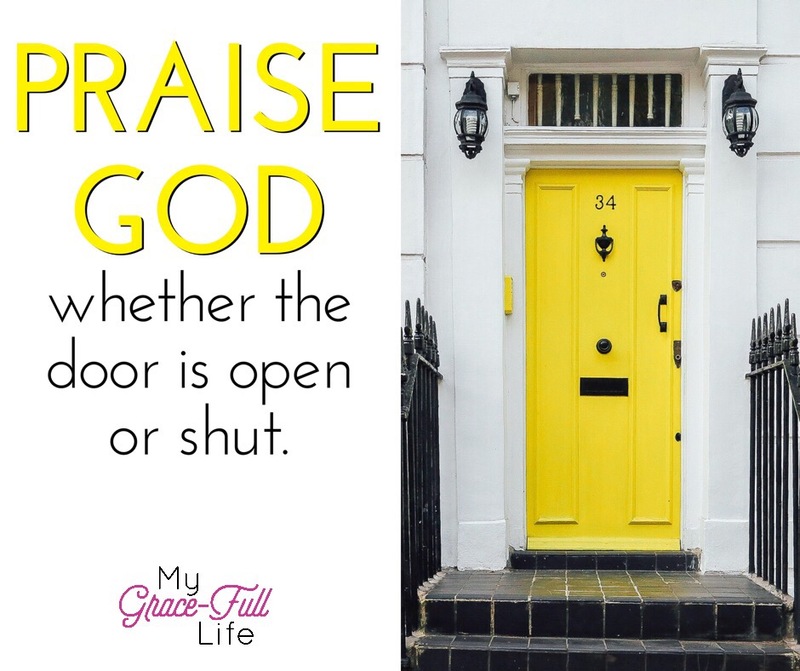 The heart of this message is – praise God, whether the door is open or closed. He is worthy of honor and glory, either way. Today, as you pray, thank God for the doors He’s opened and thank Him for the doors that He’s closed (or He has yet to open). Pray that you’ll be used either way! Next Next post: 7.4.17 Prayer Prompt: Rearrange My Priorities, Lord!